What's Eva Longoria-Parker doing with all her free time during the writers' strike? Flauting her love, for one thing. 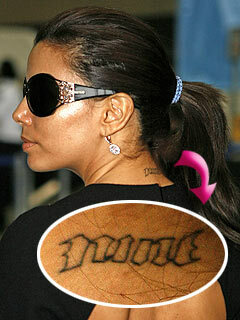 The Desperate Housewives star was spotted with somewhat-cryptic ink on her neck Wednesday. Asked what the tattoo says, a rep for the star tells PEOPLE: "Nine" – that's Tony Parker's jersey number on the San Antonio Spurs.